Use Default Subsample. Blender normally plays the animation in 24 fps or 25 fps, but the animation in the BVH file may be recorded at a different speed. In particular, the BVH files from CMU were filmed at 120 fps. Enable this option to have the animation play at natural speed, irrespective of the frame rate in the BVH file. Other subsample options are described below. Almost all character do have a left leg. The leg size is crucial for making walk cycles look good. Scale. The default MakeHuman scale is decimeters – 1 unit = 1 decimeter. Translations in a BVH file are expressed in different units; often the base unit is inches, meters or centimeters, but more obscure units can also occur, e.g. in BVH files from CMU. If the scale is set incorrectly, rotations will still be correctly retargeted, but the character will appear to take giant leaps or miniscule steps. Use Limits: If this option is enabled, MakeWalk honors any Limit Rotation constraints, and will not allow excessive rotations. If the animation in the bvh files exceeds some rotation limits, this makes the retargeted animation less faithful. On the other hand, the rig may not be built for excessive rotations, so unchecking this option can lead to other problems. Unlock Rotation: If this option is disabled, MakeWalk honors any rotation locks. If the animation in the bvh files bend around locked axes, this makes the retargeted animation less faithful. If Unlock Rotation is enabled, any X or Z rotation locks are disabled. Y rotation locks (bone twisting) are never disabled. The reason for this is that in the MHX and Rigify rigs, forearm rotation is handled by deform bones controlled by hand twisting. Auto source rig. The source rig (i.e. the armature defined by the BVH file) is specified in the Source Armature panel. Enable this option if the mocap tool should attempt to automatically identify the source rig, based on the structure of the bone hierarchy. Auto target rig. The target rig (i.e. the armature in the blend file) is specified in the Target Armature panel. Enable this option if the mocap tool should attempt to automatically identify the target rig, based on the structure of the bone hierarchy. Ignore Hidden Layers. Ignore bones on hidden layers when identifying the target rig. To obtain a slow-motion or rapid-motion effect. To quickly load an animation to see if the gross features will work out. If the Use Default Subsample option is disabled, the SubSample section becomes visible. Subsample Factor. If the value of this property is n, only every n:th frame of the BVH animation is loaded. Rescale Factor. If the value of this property is n, the time distance between keyframes is changed to n.
Rescale FCurves. Apply the settings above to existing F-curves rather than to the loaded animation. 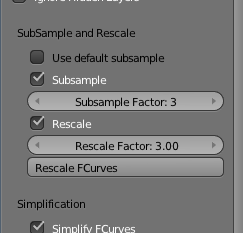 Rescaling differs from simply scaling F-curves in the F-curve editor. Simplify FCurves. Remove unnecessary keyframes. Max Loc Error. The maximal allowed error for location keyframes, in Blender units. A larger error results in fewer keyframes but less accuracy. Max Rot Error. The maximal allowed error for rotation keyframes, in degrees. A larger error results in fewer keyframes but less accuracy. Only Visible. Simplification only affect F-curves visible in the Graph editor. Only Between Markers. Simplification only affects F-curves between the two outermost selected markers. The timeline must have at least two selected markers.